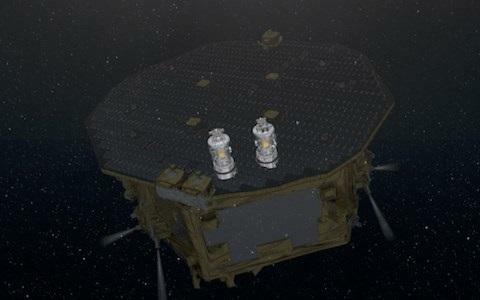 LISA Pathfinder Mission Journal: LPF far exceeds expectations! Milestones and More: Follow LISA Pathfinder mission progress including ESA's LPF Launch Campaign, LPF Mission Operations and the latest behind-the-scenes take on gravitational wave astronomy science and technology in space. 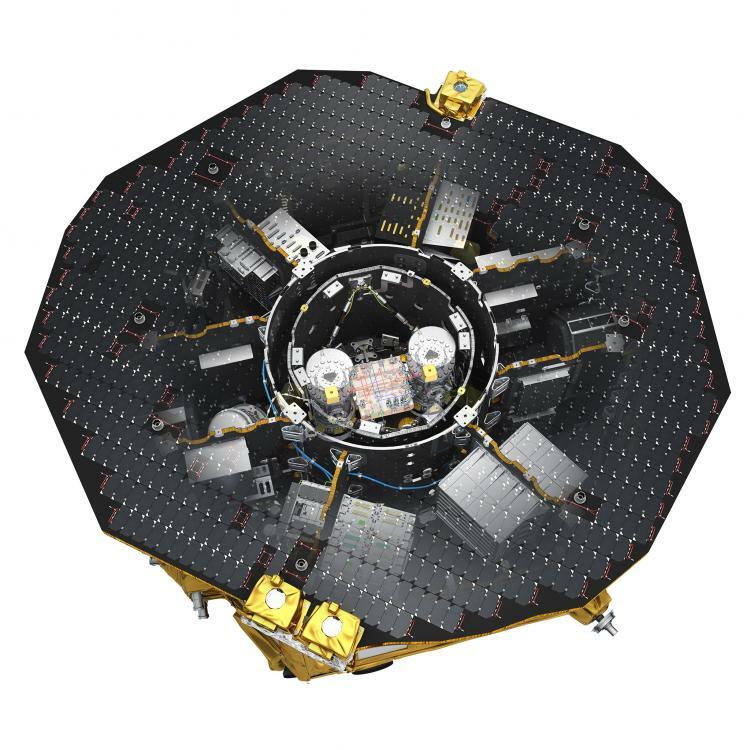 LISA Pathfinder has been switched off as planned on the evening of 18th of July, ending the mission which surpassed all expectations. Following the de-orbiting burn, in which LISA Pathfinder was pushed into an orbit which ensures it can not return to the Earth-Moon system within the next one hundred years, the final operations program of the LISA Technology Package began. In the last few weeks leading up to the switch off of the satellite, LISA Pathfinder will continue to make low noise measurements of the free-falling test masses at different operating temperatures to further consolidate the physical description of the system. As well as these long measurements, a number of shorter dedicated measurements will be made to conclude the characterisation of all the different sub-systems. On the 1st of July, the last of the science operations commands will be sent to the satellite. LISA Pathfinder, a mission led by the European Space Agency (ESA) with contributions from NASA, has successfully demonstrated critical technologies needed to build a space-based observatory for detecting ripples in space-time called gravitational waves. Now a team of NASA scientists hopes to take advantage of the spacecraft's record-breaking sensitivity to map out the distribution of tiny dust particles shed by asteroids and comets far from Earth. New Worlds New Horizons: A Midterm Assessment – the National Academies released their midterm assessment of the Astrophysics Decadal Survey in Washinton DC on 15 August 2016. ESA: LISA Pathfinder completes first operations phase on 25 June and will continue operations on 1 November for seven months to further investigate the performance of the LTP at low frequencies. 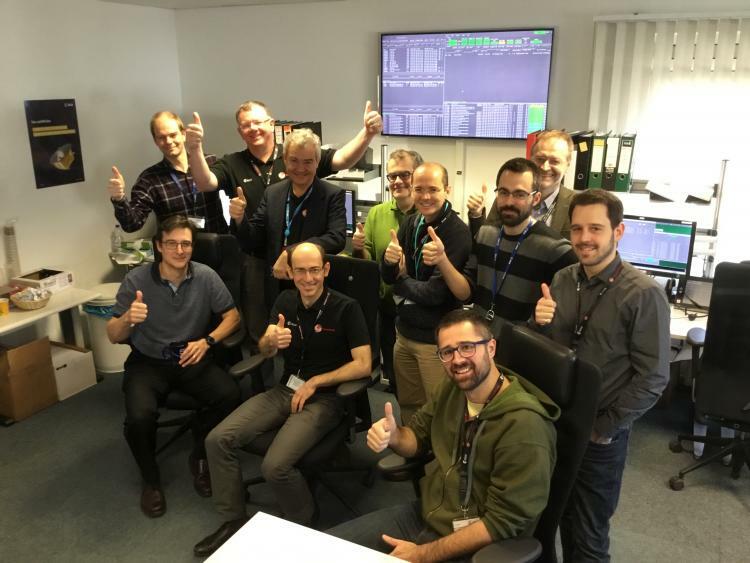 On Saturday 25 June, the LISA Technology Package (LTP) – a European payload on ESA's LISA Pathfinder – completes its nominal operations phase, passing the baton to the Disturbance Reduction System, an additional experiment provided by NASA. This won't be the last time the European experiment is run – the recently approved mission extension will see the LTP back in action for seven months starting in November this year. We have created the quietest place known to humankind! “LISA Pathfinder's performance is spectacular and exceeds all our expectations by far,” says Prof. Karsten Danzmann, director at the Max Planck Institute for Gravitational Physics (Albert Einstein Institute, AEI) and director of the Institute for Gravitational Physics at Leibniz Universität Hannover, who also is the Co-Principal Investigator of the LISA Technology Package. The LISA Pathfinder team presents the results in a paper published today in Physical Review Letters. Among the authors are 20 researchers from the Albert Einstein Institute and Leibniz Universität Hannover. The team shows that the test masses are almost motionless with respect to each other, with a relative acceleration lower than 1 part in ten millionths of a billionth of Earth's gravitational acceleration. This corresponds to the weight of a virus on Earth! On Monday, the two cubes housed in the core of ESA's LISA Pathfinder were left to move under the effect of gravity alone – another milestone towards demonstrating technologies to observe gravitational waves from space. LISA Pathfinder has released both test masses! Today, the lock fingers that kept the two test masses on LISA Pathfinder secure during the launch and cruise phase were successfully unlocked. As planned, the two cubes are still attached to the spacecraft via an additional mechanism that will hold them in place until mid February, as the teams carry on with the spacecraft and payload commissioning. 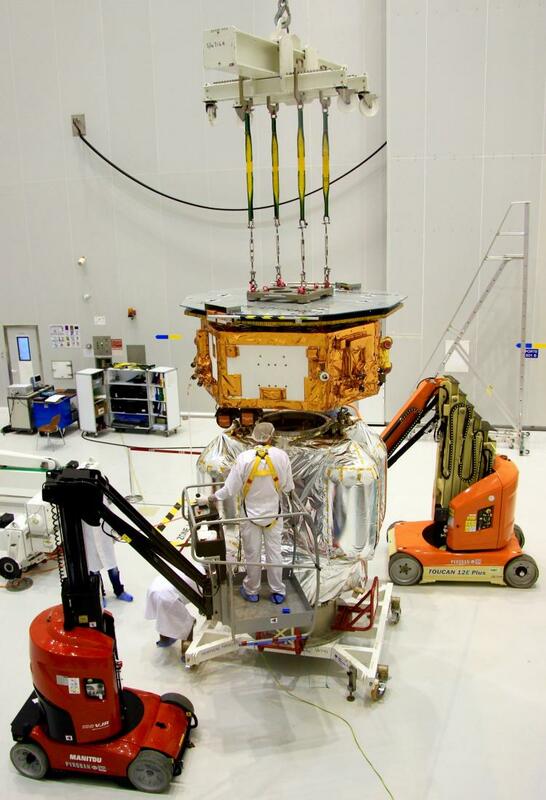 Tests on LISA Pathfinder are proceeding on schedule. The spacecraft completed its six-week journey in space, reaching its operational location in orbit around the Lagrange point L1 on 22 January 2016. Mission scientist have successfully switched on and tested the first science payload systems. Between January 11 and 13, 2016, important science payload components – the laser system, the data management unit and several inertial sensor systems – have been successfully switched on and their operability has been confirmed. LISA Pathfinder now enroute to L1! LISAPathfinder's last orbit-raising engine burn complete at 06:18CET. The burn put LPF onto free-drift transfer orbit to Lagrange Point L1. An excellent source of information on LISA Pathfinder is ESA's Rocket Science Blog. rocket science blog: news from the edge of gravity. The @ESA_LPF apogee raising burn today will be the fourth out of six. The last two will follow on Dec 10 and 12. LISA Pathfinder Spacecraft Operations Manager Ian Harrison Monday reporting on the results of the Nos. 2 and 3 apogee-raising engine burns (referred to as 'ARM' for 'apogee-raising manoeuvre' by the team). The first three apogee-raising engine burns were successful. Only three more to go! 1 down, 5 to go: first #LisaPathfinder orbit-raising thruster burn completed at 06:30CET as planned. Enroute to #L1! ESA announces a new launch time. LISA Pathfinder will lift off on VV06 at 4:04 GMT. Read the ESA announcement here! LISA Pathfinder has a ticket to ride! LISA Pathfinder overview page now online! Follow events and updates on the new lisapathfinder.org web page. All events, all updates, all livestreams! ESA will cover the launch live on www.esa.int from 03:50 GMT (04:50 CET) and the Press briefing from 05:45 GMT (06:45 CET). 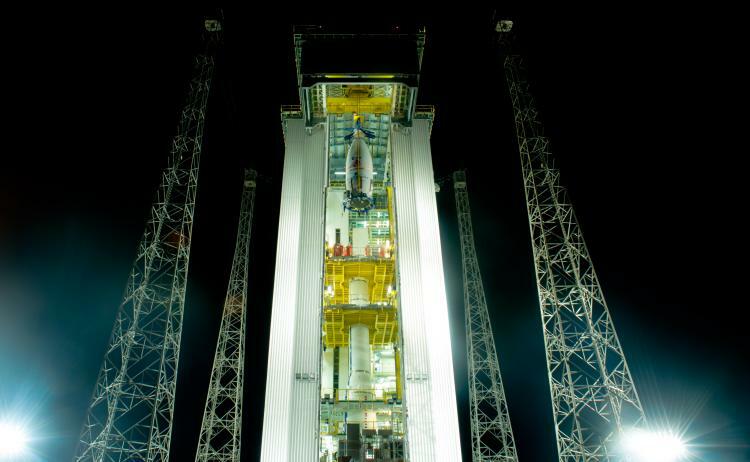 The upper composite of the Vega launcher, carrying LISA Pathfinder, being hoisted up to the top of the mobile gantry, in the launcher assembly area, at the Vega launch pad of Europe's Spaceport in Kourou, French Guiana, on 18 November 2015. Images of the integration of the "egg" onto the rocket. With only fourteen days to go until the launch of LISA Pathfinder on 2 December, preparations continue according to plan, and this week has seen another two major milestones passed: fitting the launch vehicle adapter to the spacecraft, and enclosing the spacecraft in the fairing. Read more on the ESA's LPF launch campaign webpage! 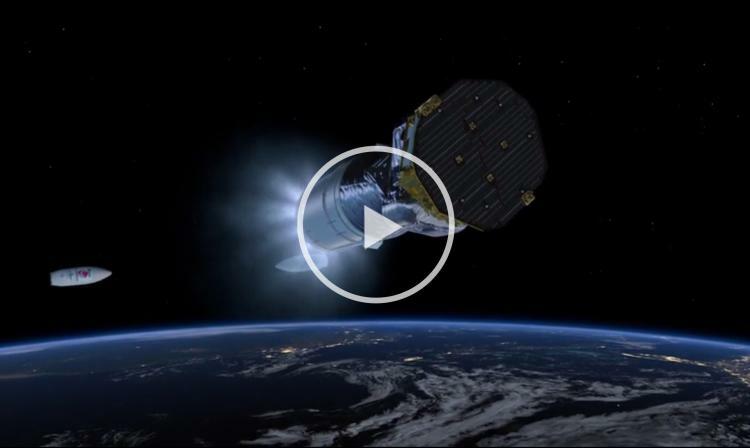 A new video by Airbus highlights development work on one of the most challenging science missions in space to date: LISA Pathfinder. 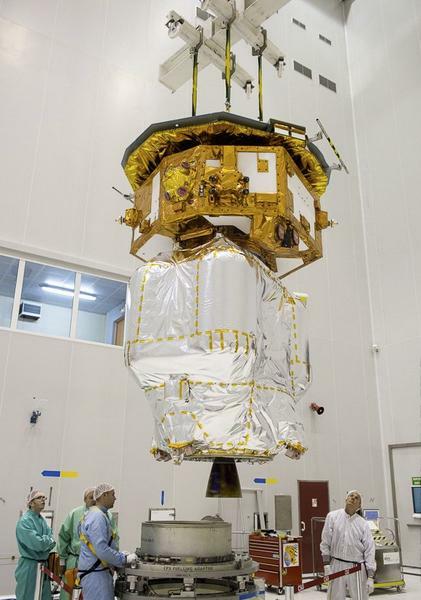 LISA Pathfinder is scheduled to launch in a few weeks from ESA spaceport Kourou. Oxidiser fueling is now complete. The next step is the hydrazine fueling. This is the first entry in the LISA Pathfinder launch campaign journal series. Between now and launch, the LISA Pathfinder team at Kourou will share their experiences as they prepare for that big event. Today's contribution is from the project manager, César García Marirrodriga. LISA Pathfinder arrived at Kourou in French Guiana on the morning of 8th October. The launch of LPF is scheduled for 2nd December 2015. 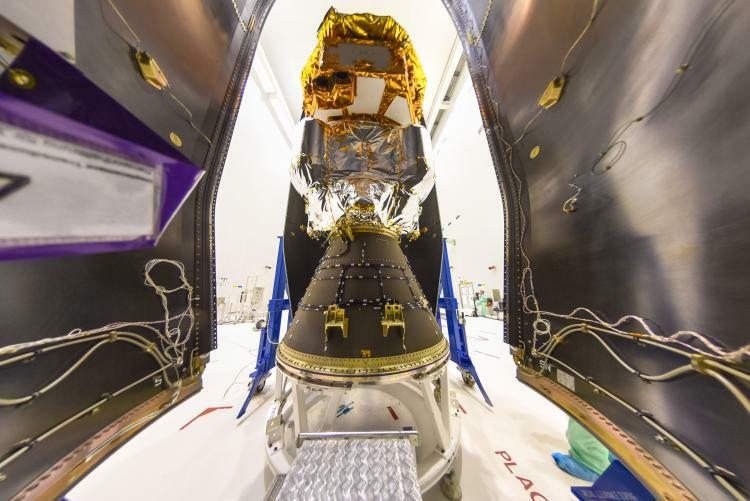 The spacecraft will be launched by a VEGA rocket on Arianespaceflight VV06 from Kourou, French Guiana, and will be placed into a slightly elliptical parking orbit. From there, it will use its own propulsion module to reach its final operational orbit, a 500 000 km by 800 000 km Lissajous orbit around the first Sun-Earth Lagrange point, at 1.5 million kilometres from Earth, where the gravitational gradients are very low. After the last transfer burn is performed, and the health of the science spacecraft is ascertained, the propulsion module will be jettisoned, then further commissioning will be performed to prepare the spacecraft and payloads for science operations. LPF's operational phase will last six months, with possible extensions.